In this comparison we are picking two top of the line ultrabooks from two separate laptop manufacturers – Dell and Lenovo. Versions that we picked for this comparison are touch screen, core i7-8550U with 16GB RAM and 512GB SSD. Both laptops have similar characteristics including dimensions, design, build and technical specifications. For instance both have Intel Core i7-8550U which is an 8th generation Intel’s latest 14nm quad core mobile CPU built for performance with efficiency in mind. Now keep in mind that these are ultrabooks so not only they are designed for performance, but also for portability, handling and tiny dimensions which are key to achieving the best user experience and satisfaction. Both laptops are light, portable and offer quite good performance. Lenovo Yoga 920 has a 360 Degrees rotational ability. This allows it to be used in different positions including tablet mode, movie mode and traditional mode. While Dell XPS 13 can’t offer that, the display goes back far enough for comfortable viewing angle. Lenovo Yoga 920 offers 2 USB type C ports and regular USB 3 port. Dell XPS 13 has 2 USB 3 ports and SD card slot. Dell XPS 13 has no pen to write with while Lenovo Yoga 920 does. 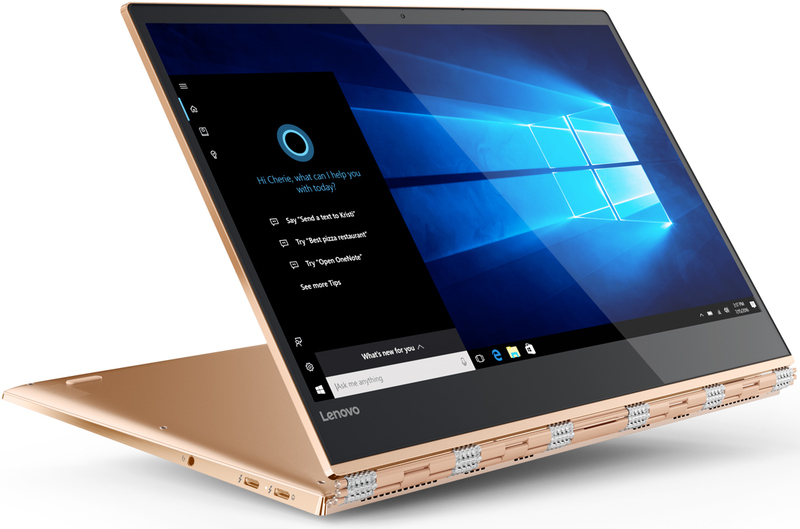 If you use Cortana frequently and want your laptop to recognize your commands from a distance, Lenovo Yoga 920 has far field microphones installed on it to pick up your voice from anywhere in the room. Dell XPS 13 has the speakers on the sides of the laptop which is a much better spot providing a full stereo experience. The speaker loudness is comparable to Lenovo Yoga 920, but has a better balance of sound. Both have identical CPUs, so the quad core 8th generation Intel Core i7 doubles the performance in multi-task environments compared with corresponding previous versions of these beautiful machines. Previous version of Lenovo which is Yoga 910 had a loud fan that would produce lots of noise at high loads. However this seems to be resolved in Yoga 920 and users claim it doesn’t exceed 40 db even at max loads. Dell XPS 13 doesn’t handle this task as good as Lenovo Yoga 920, and a cooling fan can get as loud as 50 db at high loads. Additional to that Dell’s cooling system doesn’t seem to succeed keeping up with CPU’s heat and under high loads can let Intel’s core i7 quad core CPU get as hot as 87C. Lenovo Yoga 920 has a bigger 70 watt battery but has to power a more resource demanding screen with higher resolution giving Yoga about 11 hours of regular use before needing a charge. Dell XPS 13 on the other hand has a smaller 60 watt battery but due to smaller screen size is able to power the laptop for full 12 hours of average use. Lenovo Yoga 920 has a very well spaced out keyboard with U-shaped keys. Both laptops have about 1.3mm of travel distance when it comes to their keyboards, however Dell’s keyboard has more of a click to it and thus it is more enjoyable to type on it. The touchpad is nice, smooth and spacious on Lenovo Yoga 920 and it is using Windows precision drivers for better accuracy. The touchpad on Dell XPS 13 is a bit smaller, but the material used on top of it allows for better accuracy than what Lenovo Yoga 920 provides. However as previously stated Lenovo Yoga 920 has a support for writing pen and thus partially compensates for inaccurate touchpad. Dell XPS 13 is slightly lighter and smaller than Lenovo Yoga 920. 2.9 lbs vs 3.02 lbs to be more specific. Dimensions are compared as following 12.7” x 8.8” x 0.5” Lenovo Yoga 920 vs 11.9” x 7.88 x 0.6” Dell XPS 13. Lenovo Yoga 920 is a bit thinner though. So if you are looking for very small form factor, then Dell XPS 13 would be the way to go. Lenovo Yoga 920 has a 13.9” display and a choice of 4k or full HD option. Dell’s infinity display allows for a smaller form factor and a more compact design, but the screen quality on Lenovo Yoga 920 is tiny bit better. Dell XPS 13 doesn’t offer 4k display model but there is an option for full QHD+ display which will be more than enough. Dell’s infinity display not only gives the laptop very small and clean bazels, but also provides a more immersive experience. Lenovo Yoga 920 offers a great display with SRGB of 100%, ARGB of 81% and NITS of 330 so it’s perfect for those who need amazing graphics, extensive photoshop or video editing. The Lenovo Yoga 920 is more versatile, has a superior screen, faster storage speeds, allows you to write with the pen and deals with heat management better. Dell XPS 13 is built a lot better, with all the amazing features packed in a great and well thought design finished with effective infinity display, smaller form factor and a better touch pad. If you prefer a smaller form factor and want to save some money, Dell XPS 13 would be a much better option. However if you are looking for a fancy design, platinum touch and awesome display quality, then Lenovo Yoga 920 would be a better option for you. Whichever model you choose, it will have its advantages, however those come at a cost. These two machines are very close in specifications and apart from design can be compared side by side.